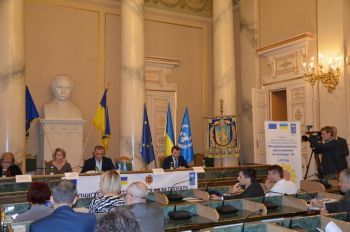 On 16 October 2014 the Third phase of the EU / UNDP Community-Based Approach to Local Development (CBA) Project was launched today in Lviv oblast with regional and local authorities, civil society organizations, private sector companies and the media. During the regional seminar participants discussed perspectives for further cooperation for promoting community-led activities to improve the living conditions of people in Sumy oblast. Distinguished attendees included the Head of Oblast State Administration Yuriy Turiansky, Head of Oblast Council Petro Kolodiy, UNDP in Ukraine Senior Programme Manager Oksana Remiga, Community Development Specialist of joint EU/UNDP Project “Community Based Approach” Olena Ruditch, leadership of rayon state administrations and rayon councils; and heads of village and city councils. “Cooperation with UNDP is not only about attraction of additional costs, but also about gaining new leading experience and innovative approaches. That is 11 implemented innovative microprojects, which mean innovative technologies in energysaving and energy efficiency of buildings. It is important that more than 40 thousands of people benefited from them, and more than 1000 children. Thanks to this technolohies, expected annual economy from the implemented technologies is from UAH 28,0 ths. to UAH 70,0 ths. on each object, depending on the type of object and type of heating system”, - mentioned Petro Kolodiy in his welcoming speech. 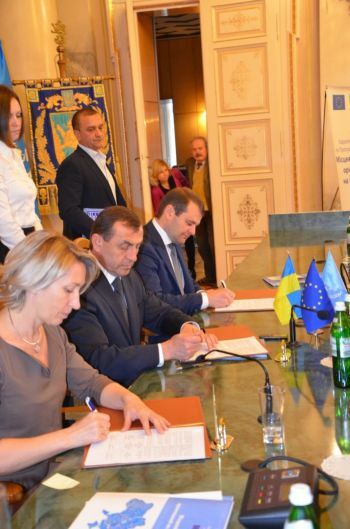 Implementation of the first phase of CBA Project commenced in Lviv region during March 2008. First phase was succeeded by a second phase in July 2011. Over these two phases, about 94000 men, women and children of the region have benefitted from improvement in 83 schools/kindergartens, 17 healthposts, 5 water supply, 2 environment, 11 street-lightning and so on. This happened through joint effort of the citizens, oblast/rayon/local level governments, CBA Project and the private sponsors.